Every year, U.S. News & World Report and its expert panel of nutritionists and physicians evaluates and ranks the best diets for healthy eating. For the seventh year in a row, DASH has been ranked as the Best Diet Overall. This eating plan is also the number-one diet for healthy eating and diabetes control and tied for first with Ornish Diet for heart disease prevention. 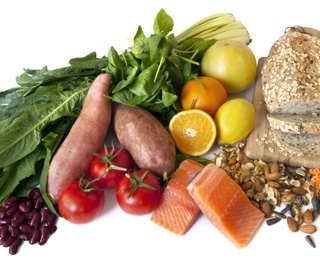 Which diets are the best for older adults? So, what is DASH? Developed by the National Heart, Lung & Blood Institute, DASH (Dietary Approaches to Stop Hypertension) is rich in fruits, vegetables, whole grains, fish, poultry and beans, and low in sodium, sweets and red meats. “I highly recommend the DASH diet, which includes a lot of fruit, vegetables and fiber. This is a diet that is low in red meat, sugar and sodium, and high in important nutrients, such as potassium, calcium and magnesium. Dietary changes can also have very beneficial effects when it comes to hypertension. Following the DASH diet can be as effective as taking a single medication — lowering blood pressure by up to 10 (mm Hg),” says Dr. Steven Nissan, chairman of Cleveland Clinic’s Department of Cardiovascular Medicine. DASH is relatively easy to implement. The eating plan requires no special foods or challenging recipes. It simply calls for a certain number of daily servings from various food groups, depending on your age, activity level and whether you want to maintain current weight or lose/gain pounds. For instance, a woman 51 or older needs 1,600 to 2,200 calories and a man 51 or older needs 2,000 to 2,800 calories, depending on their activity level. Here are tips to get started and gradually change your diet. To reduce salt intake, don’t put the salt shaker on the table. Instead, experiment with herbs, spices, lemon, lime and salt-free seasoning blends for flavor. Give yourself time to adjust: It can take several weeks for your taste buds to get used to less salty foods. And read food labels on processed foods, bakery goods, cereals and the like; look for foods that contain 5 percent or less of the Daily Value of sodium. Increase your servings of fat-free and low-fat milk products (milk, yogurt, cheese) to three a day. Cut back portions of meat and replace them with two or more meatless meals a week. For snacks and desserts, eat fruit (fresh, frozen or low-sodium canned), raw vegetables and foods low in fats and calories, such as unsalted nuts, raisins, graham crackers and popcorn (salt- and butter-free). Since DASH has more fruits, vegetables, whole grain and other high-fiber foods than you may be used to eating, gradually increase the servings to reduce bloating and diarrhea. If you have trouble digesting milk products, try taking lactase-enzyme pills (available at drug stores and groceries) with milk products. Or buy lactose-free milk. If you take medicines to control your high blood pressure, keep taking them. But tell your doctor that you are now following the DASH plan. The Mayo Clinic has an online list of dozens of DASH recipes for all your dietary needs, from appetizers, beverages and desserts to salads, sandwiches, sauces and soups. The eclectic sampling includes peanut butter hummus, blueberry lavender lemonade, rhubarb pecan muffins and grilled chicken salad with olives and oranges and cucumber pineapple salad. The Mayo Clinic staff also gives DASH lots of kudos. “Because the DASH diet is a healthy way of eating, it offers health benefits besides just lowering blood pressure. The DASH diet is also in line with dietary recommendations to prevent osteoporosis, cancer, heart disease, stroke and diabetes. While the DASH diet is not a weight-loss program, you may indeed lose unwanted pounds because it can help guide you toward healthier food choices,” according to the clinic. Your health is important to us at Kendal at Oberlin. Not only do we provide information about and encourage our residents to maintain a healthy lifestyle, we provide dietitian-approved meals in the Fox & Fell or Langston Express dining rooms. At Kendal at Oberlin, our facilities, equipment and staff encourage residents to exercise — not that they need much encouragement. To learn more about how we support our residents’ active lifestyles, contact us.